Oh THAT SCENE!! That innocent little 'Whaaat?' that comes out of Nick right before one of the biggest "What did I just see??" moments in all my animation viewing experience. It happened so fast, unexpected, and you don't have time to 'unsee' it. 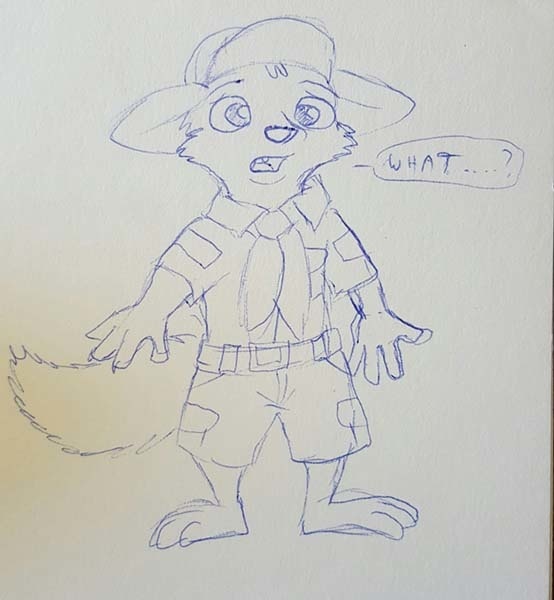 Crappy two-minute pen sketch of Little Nick Wilde with badly drawn paws and feet. I'll do a better one sometime. does it come with teh side of piees? Thanks. I know he isn't quite 'on model', but he's closer than the first one I did. That's the scene where the kids put the muzzle on him. right? Yeah I still need to draw young Judy.